The records were in the custody of Anita Rau Badami until their acquisition by Simon Fraser University Library, Special Collections and Rare Books in 2013. 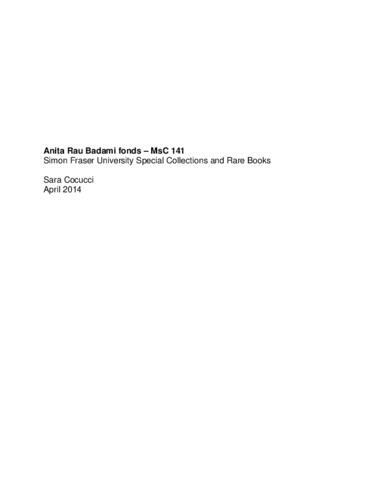 Fonds consists of correspondence, drafts, articles, reviews, and other records created and accumulated by Anita Rau Badami in the course of her career as a writer. Includes drafts of her first three novels: Tamarind Mem (1997), The Hero’s Walk and Can You Hear the Nightbird Call?. There are no records related to her last novel, Tell it to the Trees (2011). The records have been arranged in the following four series: Personal records (1992-2003); Tamarind Mem (1994-2001); The Hero’s Walk (1999-2005); Can You Hear the Nightbird Call? (2003-2006). The records were acquired from Anita Rau Badami in 2013.